End of January, already. Is it still time – like for wishing a happy New Year – to have a look at what happened last year and make a quick review of it? Yes, uh! 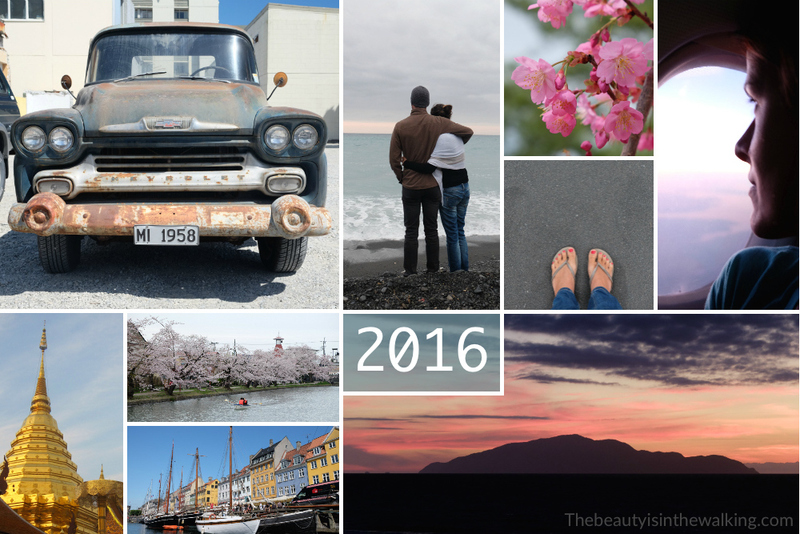 2016 was for us full of adventures; we were constantly on the move and changed so many times our way of life. It has been the end of our long trip and the beginning of an expatriation. Not a single day was alike; nothing was really planned in advance. And now it looks like a second adventure showing up after the first one. Retrospective and prospects. So, apparently setting off on an adventure is still a dream – it looks like a cliché. And it was also a dream for us. We also said to ourselves: “That would be awesome to go on a long trip one day, but you know…” But what? It’s like, we’re getting settled in our comfy routine, and days go by. We don’t feel bored either. But we have a loan going on, a fulfilling job, good friends, a loving family, etc. Well, we’ve chosen a path to follow and we haven’t had any opportunities to go on such a long trip yet. And one day, it does happen. The closer we are from the D-day, the faster time passes. The day before our departure we were exhausted. And when we arrived at our first destination, we almost slept two full days. I suppose that was the time for us to put down our bags, in a way to land, and to be able to open a new chapter. After having sold stuffs, left things behind, tidied up some parts of our past life, we finally went on a new adventure. But let’s go back to 2016. The first third of the year was the end of our trip: in January we ended a two-month stay in Australia, in February we went on a road trip in New Zealand, in March we returned to Thailand to experiment meditation on a 10-day retreat, in April we made a detour to Japan giving the excuse of springtime, in May we went back to Europe via Copenhagen (lo and behold! ), and in June, we returned to our homeport, in the French Alps. In the end, all the images and emotions were overlapping in our minds. We were full of all that we had seen and lived during the trip. We had it easy, we met lots of people, we laughed with people and about ourselves, we learnt a lot, we got upset sometimes, and we received so much, much more than we gave. Well, we lived in different ways, in different places. But among all that, one thing remains. One single thing. Like a kind of common thread. It might seem a bit stupid, or too simple a thing. But it’s something that we tend to forget, and particularly now. That’s also something we clearly realize when travelling. I’d even say that the further we travel, the more obvious it appears. It’s surprisingly simple: we realized that we’re all the same. It’s even striking how we all want the same thing. We all want to be happy and live a decent life, surrounded by our beloved ones. That’s all. At that point you tell me: “Wait! You went to the other side of the World to tell me that we are all the same?” Yes, I do. Because actually, we tend to forget it. As 2017 begins, we took a somewhat different view of things. We not only ask ourselves how we will manage to pay our rent next month, but also we also think about these Cambodian kids whom we laughed so much with around the pepper plantations. Are they now able to go to school? What about Shangri-La’s Old Town: has it finally been rebuilt? Will I eat once more this marvellous pasta soup homemade by this lovely old couple in Baisha? What about this awesome local mushroom dish we ate in Shaxi? Do the two Chinese young ladies still work at the hostel in Pu’er? Did Miho enjoy a beautiful snowy view of the Mont Fuji this winter? And all those people we crossed paths with, how are they doing? Do they live a good, worse or better life than when we saw them? In a way, we somewhat live everyday with all of them. At first glance, we could think that our lives are far different from each others’. But in fact, we so much look alike. They have become part of us; we are connected to each other. We are a whole. I often say to myself: fortunately, there are Belgian people and their off-the-wall humour, Japanese people to invent top comfort standards even in the toilets, Chinese people to remind us to behave innocently and spontaneously, French people to carry on awesome culinary traditions, American people to show us that everything is possible (except that it has gone too far this time…). Well, we’re like a big family with its good moments, its different backgrounds, its divergence of opinion… and even its borderline uncle who opens lively discussions during family meals. They had sniffed it out. I don’t even remember when we have decided to continue the adventure by settling somewhere else; I mean to go and live abroad. I think we never really made any decisions: that was evidence. So, a few months before the end of our trip, we had fun making a list of destinations where we could imagine we could live. There’s nothing more exciting! We were like kids, spinning a globe and stopping it with the finger. Come on, let’s decide where we’re gonna live next. The world was now ours. Then, our ideas became clearer and the list got shorter. Two areas in the world were in competition, two cities – quite opposite – were finalists: Tokyo and Copenhagen. To make it short, we finally gave priority to the Danish way of life rather that to Tokyo’s eccentricity and liveliness. For many other reasons, we ended up by settling in Copenhagen. End of August, we stored our backpacks in the closet and filled in our suitcases, and we took off towards this nice Scandinavian city of our good old Europe. A completely new and very different adventure began, in a less far-off but still exotic place. Veron what an inspiration the two of you are. And yet it has made me reflect again on my parents who left Scotland, all family and friends with a toddler and my mother pregnant, to start a better life on the other side of the world in Australia. What a great life that has given our family and now our grandchildren. Then I thought of myself who at 25 left all of my family and friends in Melbourne and moved to Victor Harbor to try a new life and look who I ended up with!!! Yes we are all courageous in our own way. Bonne chance Veron and Erik. Hi Marion, thanks for sharing the story of your family. It must have taken them a lot of courage to expatriate at that time, especially with a young child and a pregnant woman. And you have also proven to be a brave and independent young woman when you moved to Adelaide. I think it’s so good to be able to decide where we want to live and what kind of life we want to have, when we have the choice I mean. Hugs!